The boys from Downunder are making waves in Europe and aspiring Kiwis could perhaps do no better than to took to Australian brothers Hunter and Jett Lawrence or Kiwi riders Dylan Walsh and Josiah Natzke for inspiration. Team Suzuki Germany rider Jett Lawrence clinched the ADAC Youngster Cup Championship title at Holzgerlingen in Germany earlier this year, while fellow Suzuki star and elder brother Hunter, Husqvarna’s Walsh (from Christchurch) and Honda’s Natzke (from Mount Maunganui) also stood out in Germany this season. Jett Lawrence (pictured above) came to the MX Masters series finale with a 13-points lead and showed plenty of confidence in front of the 10,000 spectators, grabbing his victory in one of Europe’s most-prestigious series in the final race. The Kiwi riders can trace their beginnings to the mini and junior motocross scene in New Zealand and, strangely, so too perhaps can the Lawrence brothers. Hunter Lawrence finished runner-up to Natzke in the 11-12 years’ 85cc class at the New Zealand Junior Motocross Championships in 2011 and the young Australian backed that up by winning that same class outright in New Zealand the following year. At the New Zealand Grand Prix at Woodville in 2012, it was Natzke, Hunter Lawrence and Walsh who respectively finished 1-2-3 in the junior 85cc Champion of Champions race. And, remarkably, it is these same young riders from Australasian who are now battling one another in Europe. A year ago, Jett Lawrence was playing second fiddle to his older brother Hunter, but in 2018, the 15-year-old has proved himself in the motocross world, with some experts believing he has even more potential than his successful older 2018 MX2 World Championship No.9 brother. Jett Lawrence doesn’t fear the competition even though he started this year’s European MX Championship (EMX250) as one of the youngest riders on the grid. While the older riders in the class started as comparatively seasoned racers, Jett Lawrence should have been at a disadvantage from his small stature alone, but the cheerful youngster wasn‘t restricted by that and has recently impressed the MX paddock with a double win at the EMX250 Championship round in Assen, Netherlands. 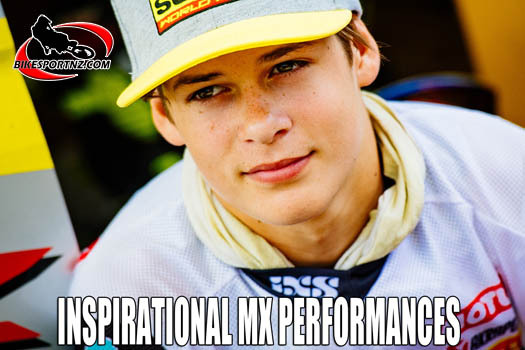 At the ADAC MX Masters Championship series, because of his age, he could have started in the ADAC MX Junior Cup 85cc, but he was aiming for a higher, tougher challenge and made the direct step-up to the highly-competitive ADAC MX Youngster Cup. The title win, which Jett Lawrence achieved at the final round of the championship in Holzgerlingen on September 23, showed everyone that the decision to move up was the right one, and took the title graciously, with a manner beyond his young years. When he was 11-years-old, Hunter showed so much success that the Australian Federation paid for his participation at the Junior World Championship. Some people there saw the talent of the young Australian, so Hunter got contracted in Europe when he was 15 years old. These early periods are now long gone but they may explain the success of the young Australian: Ambition, paired with great skill and talent, lead to big success most of the time and therefore it is not really surprising that the 15-year-old not only achieved an impressive win in the European Championship EMX250, but also won a hard-fought title in the ADAC MX Youngsters Cup.